I was on the Designer Hangout with Jacob Rogelburg last night and had a great time answering questions about concepts from my latest book, Designing Agentive Technology: AI That Works for People (Rosenfeld Media, 2017). The image links to the Crowdcast recording. Here’s a first-draft answer to your question, Rahul. Note first that I wrote a book about agentive modes of interaction with Narrow AI because these concepts were missing from our community of practice. We didn’t have vocabulary or models of best practices for when the user wants to manage a persistent and personalized AI do work on their behalf. More to the point, I did not write it because I believed it to be the best or only model. The right model depends on the product, users, and domain in question. So the first thing to keep in mind is that the agentive model is one of several that must sit in your backpack alongside others: manual tools, automation, and assistive AI. 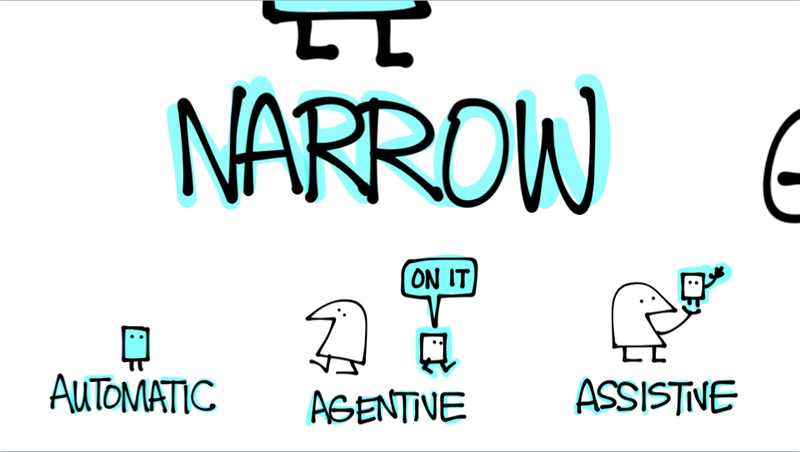 A fun illustrative slide from my overview presentation on agentive tech. The second important thing is that while I’ve been working on such projects since 2005 and speaking publicly about this material since 2013, I’m still trying to build awareness of these ideas. Acceptance and formalization of agentive practice will probably take years, presuming I—and other designers excited by these ideas—manage to build enough momentum. That is to say, I suspect no one will be hiring for a purely agentive designer for a long while to come. Your best bet to working on such a project is to make the opportunity yourself: For each new project you do, consider whether an agentive approach is right to include in your project, and if so, suggest it. Bring your copy of my book along to your pitch meeting if it helps, don’t forget Rosenfeld Media makes the illustrations available on Flickr (just include credit) for presentations, but also be prepared to argue that it is the right thing to do for this user and for the organization. A third is that if you are excited about these ideas, you can help build momentum in our community by discussing the ideas to your coworkers and clients. Suggest the topic for a book club reading and discussion. Attend of one of the workshops I offer from time to time, participate in discussions, contribute the lessons you learn. An active community of practice will help build best practices and awareness, and in the long term support your ability to do more. A last is I’m pretty confident in the models, fundamental elements of triggers and behaviors, and use cases presented in the book. But I’m just one guy who’s done this work in a handful of domains. Yes, I researched as many as I could, but that’s backwards looking. Point is, as you begin to design for such modes and systems, you’re going to learn where my line-in-the-sand needs to be tweaked. Don’t take the book as a constraint, but a jumping-off point. Also, share what you learn. I want to hear how it goes. Writing scenarios: Agentive tech differs in the way it plays out over time, and the tasks being undertaken in each touchpoint. The microinteractions and screen designs won’t bring major new challenges. This means that the bulk of the new work will be in structuring the information exchange and the sequence of events, and that means getting good at scenarios. 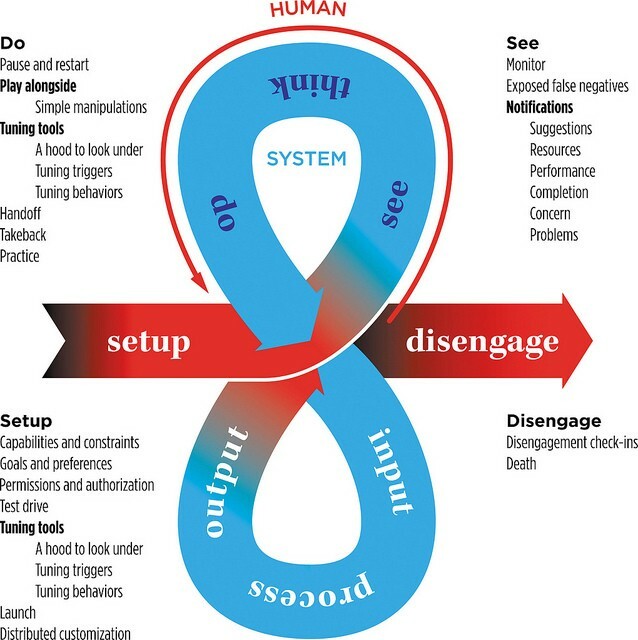 Learning how to learn: Agentive tech is built, like other enterprise software, through teams of specialists, each bringing their own perspective to bear on the thing you’re building. Interaction design has for a couple of decades now acted both as an intermediary between other disciplines as we advocate for a users’ experience and bring it into to a cohesive vision. I don’t see that changing, but will be new people on your team. Data scientists, conversational analysis, AI engineering. You do not need to become an expert in these fields, but you should be able to speak to their concerns, know their value, integrate with their processes, and be able understand and incorporate their conclusions. Those three listed above won’t be the only ones. Get used to learning as much as you can about all the new stuff that’s going to evolve. Working with the APIs: Unless you are a developer, your ability to get an AI to do fundamentally new things will be greatly limited. Better is to become familiar with the APIs that are out there in the world, and consider these building blocks. For example, following are the 15 public Watson APIs provided by my employer, IBM. These APIs are not end products. They are the building blocks of products that you will consider in your designs. Conducting agentive usability: Testing an agent when it’s doing its thing is tough, because it’s out of sight. So our old practices for testing our work has to be adjusted. I took a stab in Chapter 9, but I’m not as versed in usability studies as I am in design. Read with a grain of skepticism. A last bit of advise is just to do it. There is no substitute for actual practice. If you have some spare cycles, find a problem in the world, see if agentive concepts apply, and if so do some speculative design around it. Post your comps and storyboards to the web so people can see and discuss. It doesn’t have to be a big Hollywood production. It can even be dumb sketches. (See below.) But getting good requires doing, even if the client starts out being just you. An example of some low-production speculative design I’ve done recently for the airline industry. Thanks for the great question, Rahul. Hope this works as an answer. Post-script: Apologies to Cennydd Bowles, for my being unable to recall his last name in the moment of the recording. 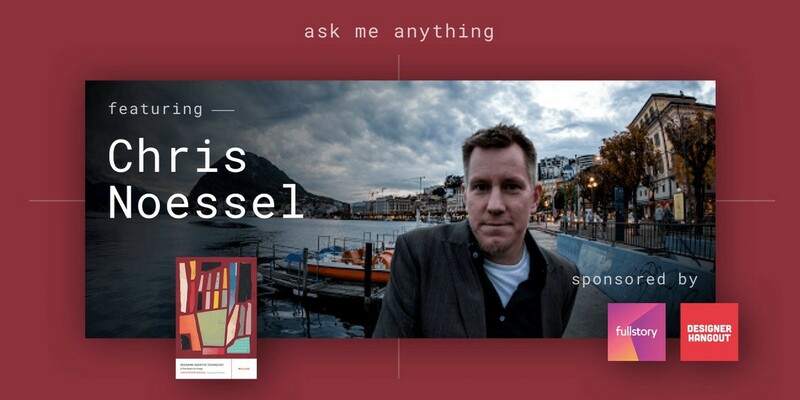 Readers, you should check out his excellent writings and talks if you haven’t already, he’s done a lot more thinking about the questions of ethics in design than I have. 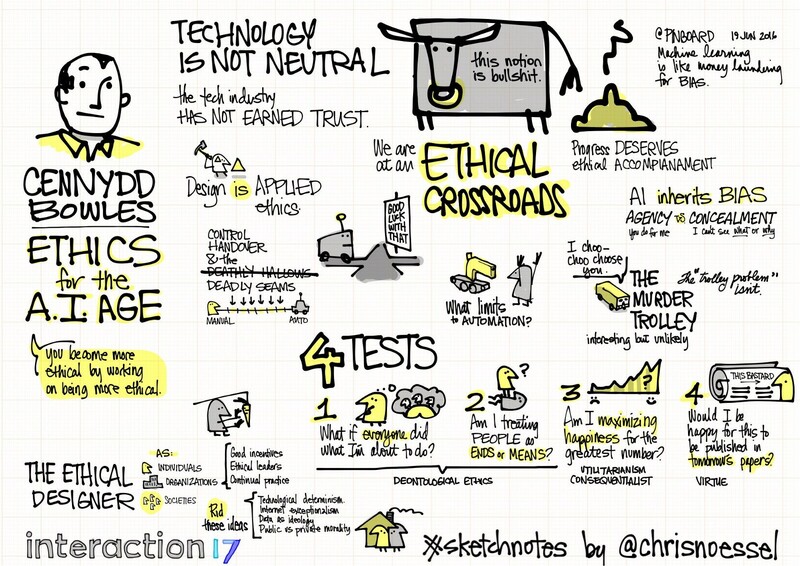 And here’s a sketchnote I did from his talk at Interaction17 earlier this year.